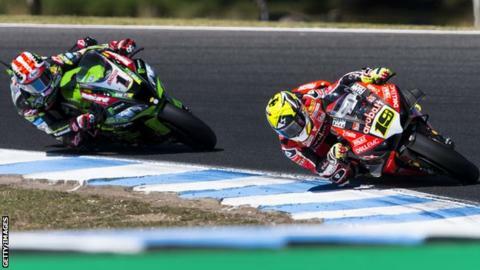 Alvaro Bautista made it 11 wins from as many races with a double victory in Assen as Jonathan Rea claimed second and third place finishes. Heavy snow showers on Saturday meant that the opening race was pushed back to Sunday morning, with the second race taking place three hours later. After a comfortable first win, Bautista recovered from Rea's overtake in the second race to extend his record. The Ducati rider now holds a 53 point lead at the top of the championship. Hat-tricks in Philip Island, Buriram and Aragon saw the 34-year-old Spaniard equal Neil Hodgson's 16 year record of nine consecutive race wins to start a season, with the victories in the Netherlands setting a new World Superbikes record. Four time world champion Rea had finished second on each occasion but the streak came to an end when he was pipped on the line by Dutchman Michael van der Mark in the second race. In the opening race Bautista remained largely untroubled throughout although Rea finished strongly narrow the gap in the final laps. Due to the delayed start, the shorter 10-lap Superpole sprint race which usually sits in between the two feature races was cancelled. A blistering start in the second race saw the Northern Irishman, who started eighth on the grid, move up to first after the first five corners. Rea held Bautista off for six laps before the Spaniard made the decisive move to regain control of proceedings. After an intriguing last-lap battle, in which Rea nearly collided with the van der Mark, the Yamaha racer's tyre crossed the finish line ahead of his Kawasaki rival to take second in front of his home crowd. "I got to the front and tried to back everything up just to get everyone involved, he (Bautista) just seemed to stick to me like glue and then blitzed me down the back section. "I was throwing everything at it. I'm happy with our efforts but unfortunately again were too far from the front. "The performance gap is just too much, I can't do anything right now but we have to put pressure on Kawasaki to improve our package."